In the Northern Hemisphere, summer ends early in most people’s minds, either on Labor Day (first Monday of September) or when school starts, whichever comes first (nowadays highly varied by locale). In fact, until I studied astrology, I considered myself to be born in autumn. Only then did I learn my exact chart and the difference between 29 Virgo and 1 Libra—the fact that I had a very late summer birth (8 hours from the cusp). I consider the purest essences of the Summer Signs to be Cancer – nurture and family; Leo—shining of self; and Virgo—serving others. In a perfect world, this sector of the zodiac gives us the loving foundation ultimately to shine ourselves, and then to go on to give back. When we cut summer short, we are truncating Virgo and the season of service, not to mention digestion. I’m not sure we leave enough space to “digest” those summer activities, some of which can be deeply transformative like summer romances, before we’re jumping headlong into fall, skipping up to a third of Virgo. I believe we have a subconscious tendency to match our activities with the seasons. Summer is full of family picnics and swimming in the Cancer element water. The family gatherings peak on the 4th of July in the USA, birthday of our bigger family, country. During Leo we catch even more sun on top of our new tans and go on adventures or participate in fiery sports events. Come Virgo, we are usually fixated on summer’s end (wah!) and getting the kids reoriented. Even if you don’t have schoolchildren, Labor Day brings the sobering realization that vacations and play time are over. It’s time to get back to work or school. It’s a psychological adjustment, and it seems to occupy us till the real summer ends at Autumn Equinox. At least the beginning of school matches Virgo’s well known mental pursuits—and maybe her picky planning given all those pencils, books and educational paraphernalia there is to buy. Review your diet for any changes you might need, especially your digestion and how various foods make you feel after eating them. What’s the state of your charitable giving, whether financial contributions or volunteer work? When it comes to “doing for others,” are you doing enough or overdoing? (See The Converse Golden Rule.) Are you suffering from compassion fatigue? How are you feeding your mind? Set goals for new habits if changes are needed. Meditation and yoga are superb for integrating body, mind and spirit. 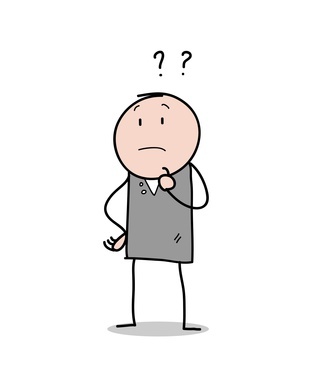 How is your health and how are your health providers? On my checklist is getting a second opinion on an upcoming surgery. How are your small animals? How is your relationship, their health? These are just a few ideas for celebrating Virgo rather than shorting her. I’m sure you can come up with many more. I’d love to hear from people in the Southern Hemisphere to find out if you have any challenges in glossing over any sign with your flipped seasons. And thanks for any thoughts you have on giving Virgo her due. PsychKicks© returns on or about September 11. I laughed till I cried the first time I saw a bumper sticker in the ‘80s at a massage school that said Metafoofoo. Here is was, finally: Metaphysical pride! The crystal users’ way of laughing at how others think of them as woo-woo. When I was looking for art depicting a psychic for one of my posts here, I could barely stand how hokey and stereotyped most of the pictures were. Talk about caricature and hyperbole. The photo here’s a sample of what I mean. It made me wonder, do Muggles still think we’re hokey, or worse yet, that we look like this lady? 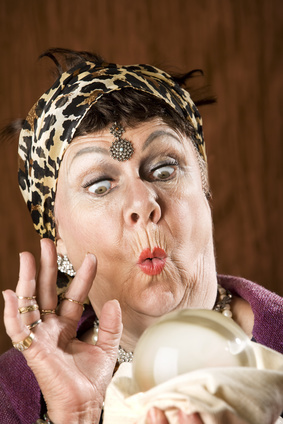 The psychics, astrologers, tarot readers and related practitioners I know look like your garden variety neighbors. Some of them might wear a celestial t-shirt or star earrings but few look like they came straight home from a circus. Many of them have day jobs in respectable professions or have made their esoteric art their respectable full-time job. The vast majority of people I know who do this work are well-dressed, well-spoken, caring, responsible and honest. However, the entire world hasn’t quite caught up to this modern view of “New Age” phenomena and those who tap its wisdom. I put New Age in quotes because these arts are as old as the hills. For instance, astrology in the west goes back at least 12,500 years. For as long as humankind has existed, so have psychics. Tarot is the new kid on the block who moved in around the year 1440. The only thing new about these tools is a modern day revival of them since the last quarter of the 20th century that seems here to stay. I prefer the word metaphysical to describe these arts and all that is implied in that term, namely things that transcend or go beyond the typical reach of the physical senses. Thus, metafoofoo tickles me in an ironic, self-deprecating kind of way. People who had direct experiences with God and the heavens used to be considered mystics, but today a surprising amount of prejudice still exists for us spiritual freelancers, especially in the name of religion. (I’ve given up trying to explain that astrology isn’t a religion and does not involve giving up your will to serve any master.) What I do appreciate is that the times are so much better now than they were when I was casting my first horoscopes in the early ‘80s. When I first moved to Sacramento in 1973, it was still illegal to practice astrology here. 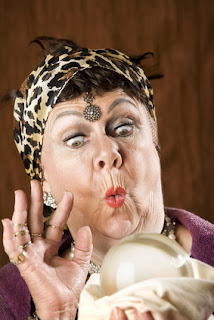 Astrologers could not get a business license and were lumped together with fortune tellers. This blessedly shifted the following year and had been kosher for more than a decade by the time I hung out my shingle in 1988. I have a great sense of humor and I never needed it more than when jury duty threatened to interfere with my living as an astrologer. I had dropped my time base at my day job to 4/5ths so I could do readings on Fridays. That was 20% of my income, and if I had to do jury duty on a long trial, that’s what I’d lose. The judge wanted to know if I had a black cat. I was sorry to disappoint him. I had cats but neither was black. (Now I could say I have such a raven-furred familiar.) He cracked me up and let me off. Judging by the laughter at my banter with His Honor, the whole courtroom seemed to enjoy these lighthearted metafoofoo moments. Other than a lot of eye rolling and not being taken seriously or considered somehow immoral by certain individuals, I didn’t have it all that bad … but I learned that for others to respect what I do, it’s mandatory to view my work as valid myself. And to let people know I do. (Their opinion of me is none of my business.) Standing up to the judge as a small businesswoman, never mind what the business was? That was a real personal turning point. I doubt I’d flinch telling the Pope about my modern-day mystical adventures. Take yourself seriously and so do others. Reminds me of the time I explained to someone that I had a different last name from my husband because I elected not to change it when I married. The response was, “Oh. One of those.” Indeed! Back then, that individual’s obvious response to me as a fanatic bra-burning Women’s Libber pissed me off. Today I’m more likely to be the one who needs to resist eye rolling when I am lumped into one of those of any kind. These caricatures just amuse me and I feel no need to explain or defend myself. How can we be good representatives of the metaphysical, astrological and mystical arts community? Not by proselytizing for sure. We have learned from the Jehovah’s Witnesses that zealous invasions of privacy hurt more than they help public image. I doubt the Witness conversion rate could come close to matching the PR damage and automatic duck-and-cover response upon seeing someone bearing The Watchtower come down your street. 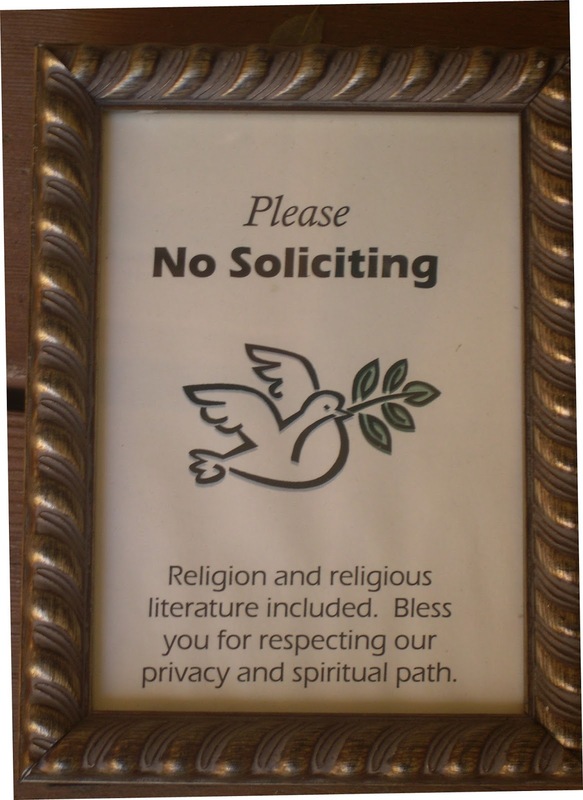 I have even included religion in my No Soliciting sign. 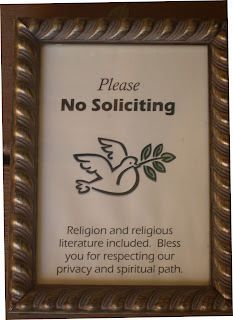 What has worked for me, so far, is not to duck a conversation about beliefs if it comes up outside the sanctuary of my home, but to respond with respect for my beliefs and the other person’s. If there are misconceptions, I give a short response stating the facts. I stay positive, happy and considerate. Often these conversations are relatively sweet, and I suspect I’ve scored one for the team. Meeting an astrologer/psychic who clearly doesn’t have horns or breathe sulfur makes an impression. Enough of those impressions and people begin to use you as a reference point when others demean what you do or people who do it. Positive impressions spread as easily as negative ones, especially if you make people laugh—as I did in my day in court. I would love to hear your experiences with metaphysical stereotypes and/or prejudice and how you deal with them … and your opinion on whether things are getting any better in this regard. How about comebacks? What worked to help people reorient their thinking about “you lot,” one of my favorite British expressions that, without much subtlety, lumps people into an unsavory group of some sort. 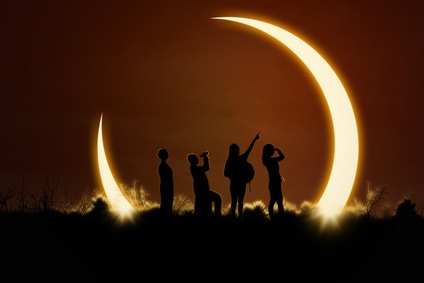 to stand under its path of totality. We risk our sight to see the Light blotted out. necks craned, eager to watch the Cosmic Lack of Light Show. PsychKicks© will be back next week. PsychKicks© ~ What If I Haven’t Got a Psychic Bone in My Body or I Can’t Pay My Intuition? In my last post, Psychic Impressions, I talked about my own intuitive and psychic experiences. I believe everyone has access to these capabilities. It’s a matter of learning how to tap into them. For now you may not resonate to “resonating” and “feeling things” outside the normal range of your five senses. But if you’re psych curious—even if you consider yourself clueless for the time being—I’ve got a lot of ideas to help you build your intuitive muscles. But first, let’s take a trip down Terminology Lane and cover some of the basic vocabulary of the 6th sense. The following link to psychiclibrary.com will be a valuable dictionary of terms as we discuss various heightened senses on PsychKicks. Consider bookmarking it and returning often. I feel strongly about one point that’s not necessarily a universal view. We live in a body. Psychic phenomena are enhanced senses, why they are often lumped together in the term 6th sense. They are not beyond the five senses but rather intensified senses that feel like they’re in a class of their own because they’re not your everyday experience of the Big Five. It’s like seeing, hearing, tasting, smelling and touching--off the charts. As long as you don't have a major sensory loss, you can probably enhance your intuitive powers. And sometimes sensory loss doesn't even tinge capabilities. Many true seers have been blind. It seems the lack of outer sight can heighten inner sight in many cases. Now that we know what we’re talking about and have a link to some words that enable the conversation to stay grounded, here's an important question. Do you really want enhanced perception? Take it from me. It’s a blessing/curse. Let’s talk about some pros and cons. There are probably many others, but here are the key ones from my own experience. Heightened sensitivities create empathy. You’ll be able to walk a mile in someone else’s shoes. This leads to greater intimacy in relationships—and great gift-giving skills, when it comes to both tangible and intangible giving. This is especially true when acute listening is one of your superpowers. People will tell you what they want but not always in a direct way. Yet a sensitive notices a glassy-eyed look when your BFF spots a certain handbag or when your relatives’ passions are woven into most conversations. You’ll have a feeling when something’s coming, even when you don’t know the particulars. You’ll sense when “this could be the start of something big” or when there's a big change in the offing. You’ll know when to avoid people or things that are bad news. You’ll have enhanced attraction abilities to find the perfect greeting card, dress, new home, relationship—and synchronicities will abound. Syncs are often hilarious and reaffirm the connectedness of everything and everyone. Sometimes you’ll feel like a raw nerve. The world can be overstimulating to someone with hypersensitivity. It’s great when we’re talking pleasure, but sometimes pain, especially emotional pain, can be overwhelming. Feelings can be so intense; overwhelm can turn into vapor lock. Speaking of overwhelm, it’s probably the biggest drawback. A sensitive must learn to take adequate alone time to meditate, recharge and simply rest. Your typical day is many more times intense than that of someone whose senses are toward the middle of the Bell curve. Not just overwhelming, being psychic or intuitive can be exhausting. 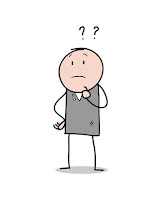 Foreknowledge isn’t always fun, especially when you’re sensing bad news afoot such as someone dear passing or a crisis brewing for someone you care about. Only you can decide if you want to go there. Some of us cross the bridge to sensitivity very early in life. In my case, there was never a choice but to roll with it. It’s just who I am. For others it’s optional. Do what feels right. Who’s a Natural? Who’s Not? The single most important aspect of developing intuitive skills is ample alone time. I was raised as an only child until I was six. I was also the oldest kid in the neighborhood. A five-year-old tires of a three-year-old quickly. The two years that separate them are like centuries. I had to learn how to entertain myself. The wide open spaces of our budding suburb and the great kid shows on early TV gave me a fertile environment to activate my imagination. In fact it ran wild. I’m surprised I didn’t have an imaginary friend. While you can’t redo your family structure or how you spent your time as a child, you can embrace the necessary inner time as an adult—any time. Things like meditation, spending time in nature, yoga and t’ai chi are all practices that heighten sensitivity. They slow us down from the din and swirling energies of modern, urban living. That way we can hear more subtle signals and our own inner voice which is connected to All That Is. If you’re lucky to live in the country, this may already come natural to you. Speaking of naturals, intuition is the realm of introverts—only 25% of the population. One reason why psychic and intuitive gifts may seem rare is that 75% of people are extroverts. This doesn’t mean an extrovert can’t develop these skills, but it does mean that their wiring is less conducive to slowing down and letting in subtler stimuli. Extroverts are too busy with people and other kinds of experiences and action. They can often balance their lives by developing a rich inner life as well as their outer one they already love. However, they may be more difficult to convince that the charms of slowing down are worth a major reorientation to become an innie/outie switch hitter. While extroverts can often snag a quick psychic impression on the fly, it’s the Tortoises that win the psychic info race over the Hares. They slow down and take their time ingesting stimuli, and their slower pace allows them to process it and figure out its meaning for them. Thinkers who are at least as much visionary as they are concrete, if not more, are also the most receptive to intuitive information (right-brain dominant). They regularly live outside the little boxes of perception, so they don’t toss things “out of left field” as aberrations. They tend to think they are valuable. Besides,very concrete thinkers often dismiss anything that they can’t hear, see, taste, touch, or smell outright. Their vision of what’s possible conforms to consensus reality. Visionaries are “reality” busters. They stretch possibility. Other than ample alone time and some of the practices already mentioned, the fastest path to raising your PQ—Psychic Quotient—is by following your dreams. Why? Because writing down or tape recording your night movies brings your subconscious to consciousness. Your psyche, connected to everything in the Invisible, is where subtle information comes from. When you have an ongoing dialogue with your Inner and learn your own personal dream symbols, you are on your way to living in the world of hunches, inklings and a sense of what’s next. Here’s to the best level of intuitive openness for you. Whatever you dream of! If you try any of these ideas and you find your psychic senses sharpening, I’d love to hear your experiences in the Comments. People with the outer planets prominent are prone to heightened intuition and psychic skills. SUBSCRIPTION: To receive PsychKicks directly in your inbox weekly, sign up for The Radical Virgo Posts in the sidebar. To report any issues subscribing, email me: joyce@joycemason.com.